Without her mentioning Cooperative Learning once, Ms Jessica Brosnan, of the Teacher Development Trust, has unwittingly written a better article on why Cooperative Learning should be adopted as a whole school ethos than I could. Ms Brosnan’s original text is italicised. (…) CPD is still all too often viewed as gathering all staff into the hall and delivering sessions during INSET days, and the idea of CPD as something to be “done to” rather than “done with” is still typical for many schools. Cooperative Learning can only be taught one way – that is through Cooperative Learning, where the teachers get an empathic experience of how a child struggles to take on-board new knowledge, often partially outside their frame of reference and easily misunderstood due to incorrect assumptions or connections made to correct assumptions. In CPD using Cooperative Learning, nothing is being “done” to you, you are the “doer” constructing knowledge relevant to you in a discreetly guided, yet simple, organic process. These one-off lectures and activities often have little or no follow-up, and staff may come away with new knowledge, but none that is particularly relevant to them, or the pupils’ they teach. Research suggests that this is the most common training experienced by staff and yet also the least effective at improving practice. Nevertheless, many school leaders try and pack out their INSET days and twilights with endless seminars and workshops and deliver too many ideas in too little time with insufficient chance to practise, reflect, and collaborate. This is why I have been advocating CPD in 2 hour block twilights with limited scope, and why there should be a 6-8 week gap between blocks. Plenty of time for trail and error, to be dealt with realistically in the following session. It is worth noting that studies suggest that, on average, it takes teachers more than 30 hours of planning, teaching, collaborating, reflecting, enquiring, discussing, learning and thinking to create a sustained, effective change in teacher practice in a single area. The collaborating, enquiring, discussing, (in fact all of the above, given thinking is also enlightened by sharing), is best afforded by using the same CLIPs in the staff room; if its good enough for the pupils, it’s good enough for us as teachers, isn’t it? And my experience is that Cooperative Learning is just as engaging for adults. You don’t grow out of loving to hear your own voice. Ultimately for staff to buy into the CPD processes within their school, it needs to be relevant to their needs, have an impact on the pupils they teach, and they need to be given appropriate time to embed any changes to their practice. This is why in each CPD session, the subject knowledge of Cooperative Learning as a tool, is interlaced with collaborative negotiation of its impact in specific subjects, specific students and classes, with specific materials. Recently at Rashidun, a London supplementary school, a full unit was committed to actual lesson planning. In some of the most successful schools, participation in some form of collaborative enquiry has been explicitly linked to appraisal, ensuring a professional development target with a clear pupil-focus. As teachers, we are driven to meet the needs of our pupils, and where CPD is closely linked, it will be more engaging. Teachers and learning support assistants have regular, dedicated and uninterrupted time during term to carry out collaborative and reflective development; conversations about pedagogy and evidence are common. Staff collaborate to decide a few key whole-school professional development areas for the year and these inform the school development plan and performance management processes. A specific member of the governing body is responsible for monitoring CPD processes. This really needs no further comment relation to the CPD I am already providing. However, an interesting CPD session would be how to use Cooperative Learning to stage a staging staff-room, rather than classroom, enquiry. Maybe an add-on to Skills&Mastery and the other strictly CL courses? (see Stalham Academy post for more on this). All the research around what makes effective professional development points towards teacher enquiry processes, where teachers get to collaboratively explore and improve their own practice. This has been shown to have much more impact on student outcomes than sending teachers on one-off courses or bringing in speakers to conduct after-school lectures. Interestingly for me, the author then discusses Lesson Study (?) as a possible solution. I always claim that the structural approach to Cooperative Learning fuses with any other didactic method, from Doug Lemov to MoE, but it is always interesting to find corroborating evidence: In Lesson Study, imagine using Think-Pair-Share with multiple triad members, who would then feed back to home teams using Puzzle? 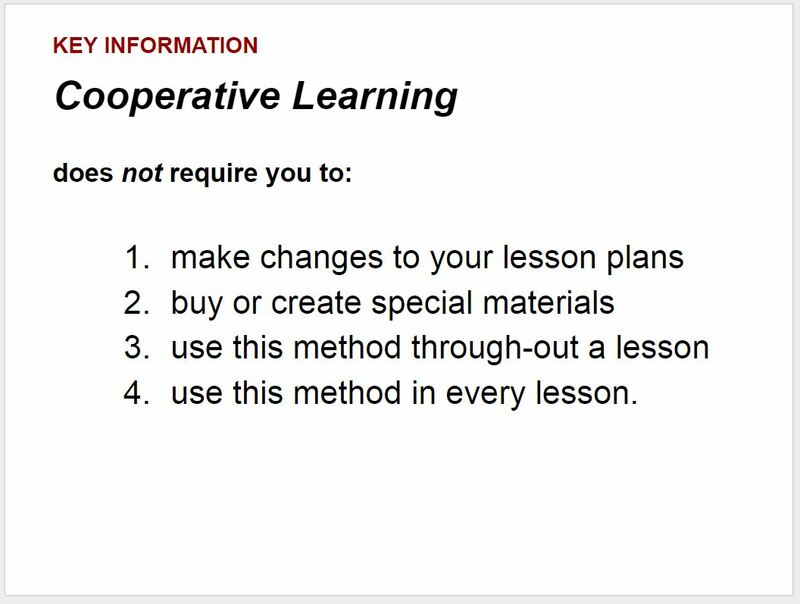 Might be financially shooting myself in the foot here, but schools might not even need an add-on package: If students can “learn how to learn” – to paraphrase Ms Gillespie – using Cooperative Learning, why not teachers? That would be a real collaborative school ethos, when students knocking on staff room door in the break catch their teachers doing Catch-1-Partner to debrief! More on Catch-1-Partner, including staging, in this post. For an oldish detailed handout, see last year’s newsletter eCL #1: The Dance Floor is made of Lava + eCL #1 bonus: Mindmap in jpg for easy reference. For Catch-1-Partners relation to CELTA classics such as “Carousel” and “Ladders”a full CL lesson, see Norwich High School for Girls; A tailored workshop lesson plan. Read Ms Brosnans full article. More videos with Ms Gillespie et al.